The group in the dock at the General Court Martial in Makindye. A group of senior police officers and their juniors were on Tuesday afternoon arraigned before the General Court Martial in Makindye and several charges related to kidnap and repatriation of Rwandan refugees read to them. The senior police officers included the former Police Director in charge of Crime Intelligence, Col.Ndahura Atwooki, ACP Herbert Muhangi, the former Flying Squad Commander, SSP Richard Ndaboine (former head of Police Cyber Crime Unit) and Nixon Agasiirwe(former commander, Special Operations Unit). Others were AIP Jonas Ayebaze, ASP Patrick Muramira(former deputy commander police Special Operations Unit) and Detective constable Abel Kitagenda. A few minutes to 3pm, a white Chieftaincy of Military Intelligence van escorted by a military police patrol truck full of soldiers arrived at the army court before the seven police officers disembarked while on handcuffs, save for Col.Ndahura Atwooki. They were led to the court cells before they were shortly taken to the dock for the charges to be read to them. Dressed in plain clothes, save for Col.Ndahura who wore an army uniform, the police officers stood quietly as they waited for court to start. The court’s Judge Advocate (advisor to court)Col. Richard Tukachungurwa later asked the accused the language they would wish the court to use while reading their charges before they all accepted to proceed in English. 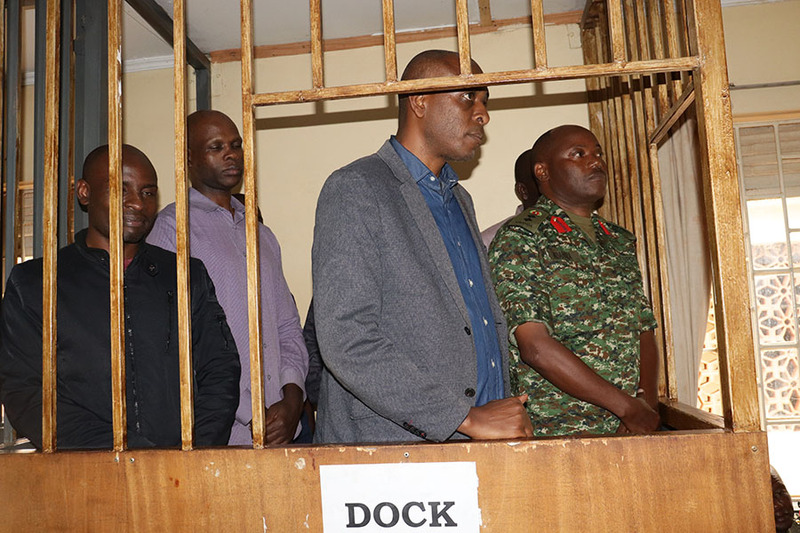 “You are charged with aiding and abetting kidnap and repatriation of Rwandese refugees back to Rwanda,” the court chairman, Lt.Gen.Andrew Gutti read the charges for the group. They were also charged with failure to protect war materials contrary to section 122(1) (2) (d) of the UPDF Act 2005. Lt.Gen. 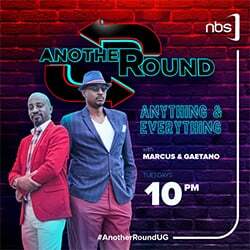 Gutti read that between the year 2010 and 2018 the police officers on various occasions allowed the issue of arms and ammunitions to unauthorized persons including members of Boda boda 2010 led by one Abdullah Kitatta. They all told court that they understood the charges but denied them. At one moment, when Lt.Gen. Gutti read the charge of failure to protect war materials to the group, the former Flying Squad commander, Herbert Muhangi shook his head in disbelief. Former head of Police Cyber Crime Unit, Ndaboine kept on smiling as the charges were being read to the group. They were remanded to Makindye military barracks until February 11 after the prosecution told court that investigations into the matter were still on going. The group was charged together with the former Inspector General of Police Gen.Kale Kayihura who was not in court on an amended charge sheet. All the officers were directly under the supervision of Kayihura because the specialized units that they either headed or worker for were under the office of the Inspector General of Police. Boda boda 2010 patron Abdalla Kitatta on Monday told the army court that he is no liable for any guns found with him saying that Gen.Kayihura together with Nixon Agasiirwe gave a go ahead for him to be given a police guard armed with an SMG rifle and a pistol. This was the first time most of the accused were being arraigned before any court to be charged with any offence since their arrest, seven months ago between June 11 and 13 13 from various places around the country before being detained at Makindye military barracks. Following the arrest of Gen. Kayihura, the army carried out a purge on several of his cronies especially in the police force that he once leaded. These have been detained at Makindye for several months by the army without trial. In November last year, relatives to the detained officers cried out to President Museveni over the detention saying they didn’t know where their relatives were or the offences against them. “At least he(Museveni) should ensure they are released on bond pending as they wait to be taken to court,” said one Geoffrey Bigabwa who introduced himself as a younger bother to Col. Atwooki Ndahura. They urged that the rights of their relatives who had been in detention for more than four months ought to be respected by the state. “If their boss (Kayihura) was released on bail, why are the juniors still being held incommunicado? It is a gross violation of their rights,” said Peace Ndahura. The army later said investigations into the matter had not yet been concluded. President Museveni has on several occasions described the purge on senior police officers as one meant to clean the police force of “been weevils” that had infested it.